Our customer Andrew Goode, from Water Tight Canberra, was a recipient of the 2018 Rheem Apprentice Plumber Grant. Read how the grant helped Andrew. Andrew was a second-year apprentice plumber studying at the Canberra Institute of Technology’s trade centre at the time of winning the grant. He’d heard about the award before, but it was one of our Fyshwick trade sales consultants and his boss Tom Martin, who encouraged Andrew to apply. And he’s sure stoked he did! Andrew used the $3,000 grant towards the cost of his tools. 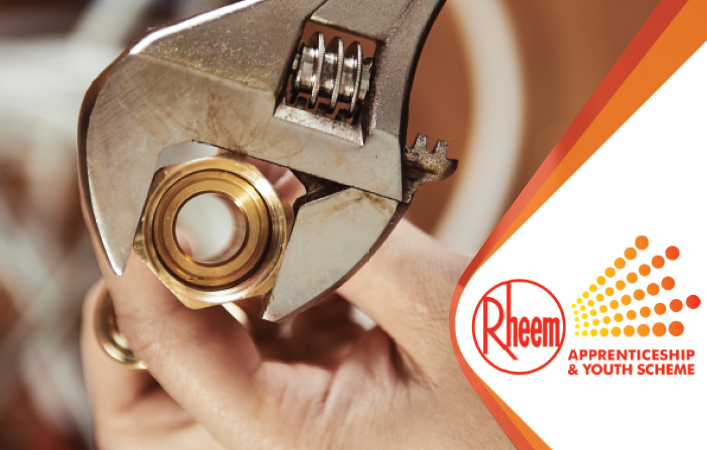 The local WIN News was quick to share the story of how Rheem puts its support back into the plumbing industry. The grants are available to current plumbing apprentices and those just starting their plumber’s apprenticeship Australia wide. Previous grant recipients are not eligible to enter. How many grants are available, and what is the value? There are 10 grants available, each worth $3,000. What costs do the grants cover? $2,000 towards study including TAFE/CIT fees and a $1,000 tool voucher. Monday 4 February – Applications open. Download the application form or complete it online here from 4 February. Monday 1 April – Applications close. Friday 10 May – 2019 winners announced. Best of luck applying, and let Southern Plumbing Plus know where we can assist.